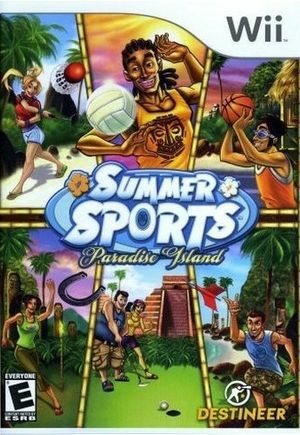 In Summer Sports: Paradise Island check into the Paradise Island Resort and explore the vast array of recreational activities in a lush tropical environment. Compete against friends in a collection of summer-themed games including Basketball, Croquet, Lawn Darts, Badminton, Volleyball, Horse Shoes, and Mini-Golf. Bump, set, spike, throw, putt, shoot, swing, and more - all with intuitive Wii Remote gestures! The graph below charts the compatibility with Summer Sports: Paradise Island since Dolphin's 2.0 release, listing revisions only where a compatibility change occurred. This page was last edited on 13 January 2018, at 14:13.